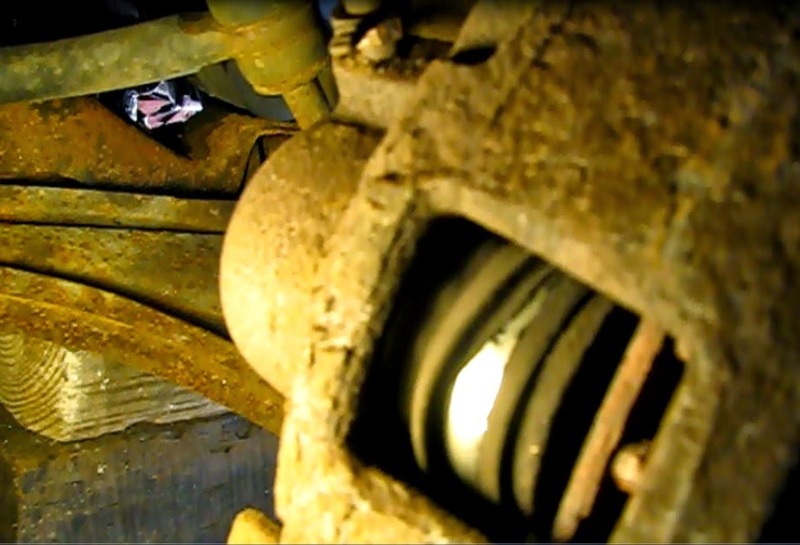 The right front caliper on this 1997 Pontiac Grand Am completely seized up, leading to a permanent "brake on" grinding noise. A re-manufactured caliper on this car is just $23.85, so I decided to replace both. New rotors and pads were also required. I intended to change the brakes hoses as well, but found both to be so badly seized to the steel brake lines that I feared I would snap off the fitting or bend and damage the line. 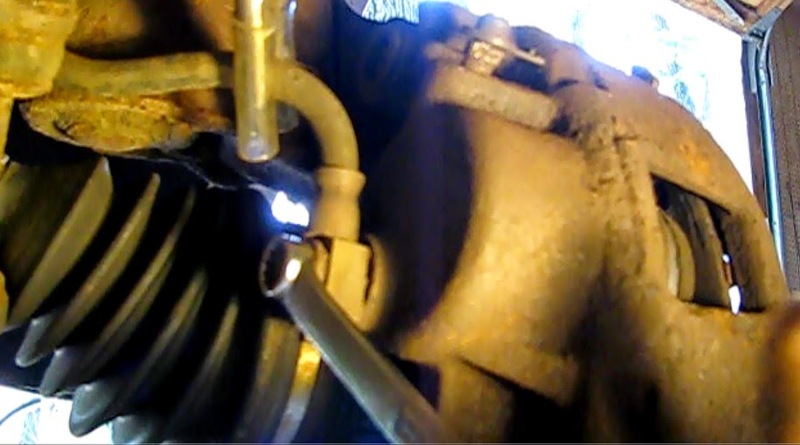 This car had other issues with the lower ball joint and sway bar links. The hoses would have to wait. Safety: Safety glasses, gloves, and a dust mask. Parts and materials: Two rotors, two sets of brake pads, caliper or anti-squeal grease, lacquer thinner, brake parts cleaner, brake fluid. Cost of materials: rotors and pads(two wheel set) $62.53. Calipers 2@ $23.85ea. Shop labor cost for the job: $100 on average. 1) Break the lug nuts and jack up the front of the car. On this car, I used two jacks. 2) Remove both front wheels. 3) Turn out the brake bleeder on the seized caliper. If the caliper now releases it's grip on the rotor, this would indicate a bad brake hose. If not, it's the caliper. It's the caliper. 4) Pinch off the brake hose with vice grip pliers to keep the entire system from draining. 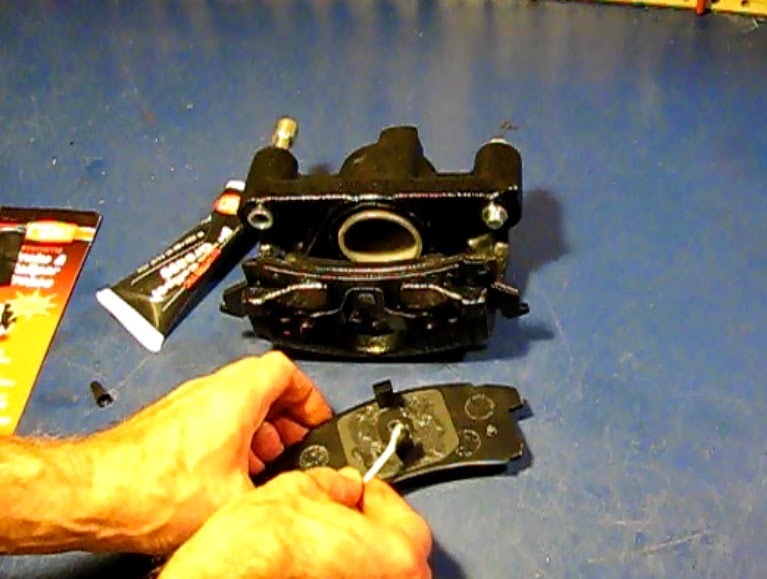 5) Disconnect the caliper brake hose banjo fitting from the caliper with an 11mm socket. Use an 11 mm wrench or socket on the banjo fitting. Note the tubing covered vice-grip pliers on the hose. 1) Mount the new rotor. Don't forget to clean up the contact surface of the hub with a wire brush and solvent. Then apply some caliper or other grease to the surface of the hub and under the "hat" of the new rotor. These can rust on, and be a real pain to persuade to come off. 2) Make sure the piston is retracted all the way. As I am using a re-manufactured caliper, it should be. 3) Place anti-squeal compound or caliper grease on the part of the friction plate that contacts the pad holder portion of the knuckle. 4) Mount the new pads. They snap in place with no external hardware. Slick. 5) Mount the now “loaded” caliper on to the knuckle. 6) Torque the bolts to 38 ft pounds with a 3/8” Allen socket. 7) Remount the brake hose banjo fitting (with new washers, included in the caliper kit) and torque to 33 ft lbs. 8) Repeat removal and re-assembly steps 1-7 on the other side. With brakes it always best to do one side at a time. 9) Bleed the brakes. Check the master cylinder for brake fluid level. If it was allowed to go empty (as mine did), it will be necessary to bleed air out of the entire system. This is done in a certain order, furthest from the master cylinder closest. So it’s right rear, left rear, right front, left front. I used a one man brake bleeder and found the results disappointing. I then fell back on the reliable two man method. How hard is it to find someone to sit in the car and apply and release the brake on command? An 8mm box end wrench will be needed for the bleeder screw. The back brake bleeders were badly rusted and required replacement after I won the battle to remove them. 10) Remount the wheel (again, clean the inner contact surface of the wheel with the rotor and apply some grease). Tighten the lug nuts as much as possible before setting the car down and torqueing in stages to and in a star pattern, ending at 80 ft lbs for steel wheels.